When I first began to knit there was so much to learn. Yarns, needles, stitches, patterns, gauge, on and on. I remember looking for my first set of straight needles. Plastic? Metal? Wood? Staring at the wall in the shop I was full of what ifs? I tossed that all aside and followed my instinct which was telling me to choose the rosewood needles. 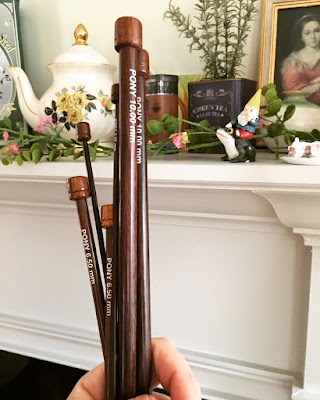 I bought a set of Pony needles in US8. They became my favorites and I went on to exclusively buy them. Now rosewood is not good to buy as it has been over harvested so I don’t buy this wood anymore but I take good care of the ones I have. As for circular needles my Addis are top. Love them so much. I laugh now thinking about how when I first looked at circular needles and said I would never use something so silly. I learned my preferences changed as my skills improved. Now I use circular needles everyday!